The Egyptian High Commission for Elections has decided to extend the candidate registration period for the upcoming parliamentary elections – covering both the People’s Assembly (lower house) and the Shura Council (upper house) – until 22 October 2011. The decision comes after a number of political groups and parties demanded an extension by the country’s de-facto military rulers, the Supreme Council of the Armed Forces (SCAF), in order to reorganise themselves, particularly after several electoral blocs and coalitions experienced recent splits. Political splits, however, continue to take place. The main two electoral coalitions, the Democratic Alliance for Egypt and the Egyptian Bloc, formed a few weeks before the candidate registration window opened last Wednesday, are witnessing major fissures that could affect their popularity and electoral viability. Consisting of 40 parties, the Freedom and Justice Party (FJP) led Democratic Alliance for Egypt has recently seen a number of its allies pull out leaving the FJP, the Muslim Brotherhood’s political arm, with just 16 partners to form its electoral lists. According to Wahid Abdel Magid, the election's coordinator for the Alliance, the Brotherhood’s FJP will dominate more than 60 per cent of the Alliance's 47 electoral lists, especially after the liberal Wafd, the Salafist Al-Asala (Authenticity Party), the Arab Unity and the Arab Democratic Nasserist parties all backed out for various reasons. The FJP will also run for more than 70 per cent of the individual seats. All of the Alliance’s parties will run in the polls under the flag of the FJP, as Egypt’s Electoral Law does not permit members of electoral alliances to run under their own names. Rather, Alliance members are expected to field their lists under the name of a specific authorised party. After failing to reach a compromise with the FJP on the nature of their lists, the Wafd became the first party to withdraw from the pact, deciding to run in the upcoming elections with its own independent lists. "We have many members who want to run for the elections and so do the FJP; it is only fair that people should have the last word," Essam Sheha, a member of the Wafd, told Ahram Online. However, even the Wafd seems to be having issues with its lists, as certain members insist on running in the parliamentary polls, while the party's high commission thinks otherwise. Mostafa El-Gendy, who recently resigned from the party, was among those who censured the Wafd for allegedly integrating ex-members of ousted president Hosni Mubarak's National Democratic Party (NDP) into its lists. After the Wafd announced its withdrawal from the Democratic Alliance, other parties began to follow suit – often for similar list-related reasons. The Alliance, which was seen by many as an Islamist pact, was also spurned by the more radical Islamist parties. The Salafist parties, Al-Nour (Light Party) and Al-Asala Party, also decided to leave the Democratic Alliance after failing to reach a compromise with the FJP on the number and position of their candidates in the electoral lists. In the meantime, both parties have decided to form a new list. Furthermore, the two parties will call on Al-Jamaa Al-Islamiya’s Building and Development Party to join their new electoral alliance. Emad Abdel Ghafour, head of Al-Nour, told Ahram Online that the new alliance will submit its lists just before the registration door closes, in order to give other parties the chance to join. According to the Salafist leader, other parties with Islamist underpinnings, such as the Wasat Party, have been approached. The new Islamist alliance will run in the elections under Al-Nour’s flag. The Arab Democratic Nasserist Party has also decided to field candidates under its own lists after pulling out of the Democratic Alliance when it failed to reach a compromise with the FJP on the number and positions of their candidates on the lists. Speaking to Ahram Online, Sameh Ashour, the head of the Nasserist Party, stressed that his party did not initially join the Democratic Alliance for electoral reasons alone. Rather, the attempted alliance was an illustration of the party's resolve to form a national united front capable of pushing the revolution forward and achieving its demands. "However the contentious position adopted by the FJP made it difficult to even reach an agreement on the elections. The Alliance proved to be a way to help the Muslim Brotherhood dominate Parliament and the whole political scene," emphasised Ashour. For their part, sources within the FJP linked the Nasserist Party’s departure to the electoral committee’s decision to exclude Ashour from the electoral list given that he is running for elections in the Lawyers’ Syndicate. 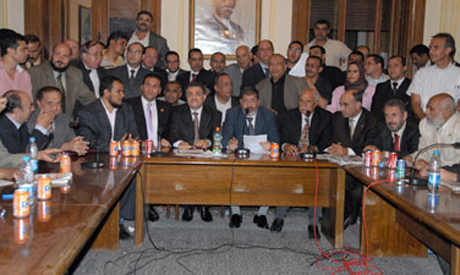 Yet, even after the party left the Alliance, Ashour announced he had no intention to run for Parliament. As it stands, the Nasserist Party, like the Wafd Party, will have a list of its own. Similar complications are taking place within the Egyptian Bloc: the electoral alliance established as a counterbalance by business tycoon Naguib Sawiris and his newly formed Free Egyptians Party and the Egyptian Social Democratic Party. The Socialist Popular Alliance Party (SPA), a major leftist party formed after the January 25 Revolution, recently withdrew from the Bloc to form a leftist electoral alliance. A number of other leftist groups and organisations are expected to join the SPA’s list under a pro-social justice banner. Among those expected to join are the Revolution Youth Coalition as well as the Egyptian Socialist, the Egyptian Current and the Egypt Freedom parties. The SPA had previously announced its decision to join the Egyptian Bloc under certain conditions. These conditions, however, were not respected. "Our main condition was that ex-NDP members who were part of the elections process in 2005 and recently in 2010 cannot participate in the Bloc's electoral lists," stated Talaat Fahmy, a member of the SPA’s high committee. “Nevertheless, as soon as the Bloc’s parties began handing out their electoral lists, we discovered the names of many ex-NDP members and this was unacceptable." The SPA, according to Khaled Abdel Hameed, a member of both the party and the Revolution Youth Coalition, had another problem with the Bloc even before the lists were released. "We could not agree to a common programme that prioritised social justice and the right of workers to organise; this was not something to be negotiated, especially since we consider social justice to be one of the main demands of the revolution," he told Ahram Online. Offering similar reasons for their withdrawal, the Egypt Freedom Party broke away from the Bloc just 48 hours after the SPA. They cited a “lack of transparency” in the candidate ‎selection process and the presence of many NDP figures on the lists. The Egyptian Bloc’s High Commission for Electoral Coordination deny these allegations, insisting that no former NDP members made their way onto the lists and that the Bloc's doors would remain open to both parties, should they reconsider. The 18-party Bloc said that it will run in 90 per cent of the electoral zones with full coordination in the individual race. With time fast running out, the older electoral coalitions scramble to reorganise their lists, and the newer coalitions struggle to properly establish themselves, leaving many to ask questions both about the viability of the electoral list system and the coalitions that came out of it. "For any list to survive it must reflect the consensus between its members both ideologically and politically as this will make it easier for the parties to compromise," political analyst Amr El-Shobaki asserted. "This was not the case between the Wafd and the Muslim Brotherhood, for example, or the liberal Free Egyptians and the leftist Socialist Popular Alliance. This explains why the pacts between them could only fail," he added. For Shobaki, the disintegration of the electoral alliances should make all political groups understand that there is more to politics than narrow electoral calculations. "We need to learn the values of democracy, not just its mechanisms."